Plant a shamrock! 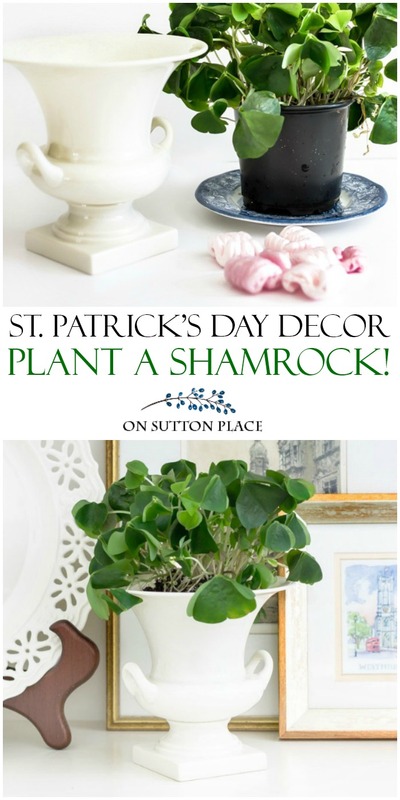 An easy and budget-friendly way to bring a colorful natural element into your decor and celebrate St. Patrick’s Day! I’m not Irish…not even one little bit. However, I married a guy who takes his Irish heritage very seriously. His mother’s family came over from County Down. My kids have some of that Irish blood in them as well, so naturally a tiny bit of the blarney has rubbed off on me. We also rank among the most obsessed fans ever of The University of Notre Dame. My husband and son are alumni so we arrange our lives around football season and bowl games. (Don’t laugh. I’m serious.) The first song my daughter learned to sing was the Notre Dame Fight Song. So…for years I have seen shamrock plants around St. Patrick’s Day in the stores. One thing I have never done is plant a shamrock. I’ve been trying to decorate with natural elements for a while now. At this time of year, something live and green in the house seemed like a good idea. So plant a shamrock I did. It took all of five minutes. I found a lovely shamrock plant at my grocery store. The root ball was a tiny bit big for the urn I wanted to use so I just brushed some of the dirt off until it fit. I put a few packing peanuts in the bottom of the urn so the water would drain. I no time at all, I had a little bit o’ Ireland right in my own home. Even if you aren’t Irish, I highly recommend that you plant a shamrock. It’s green, natural and alive. 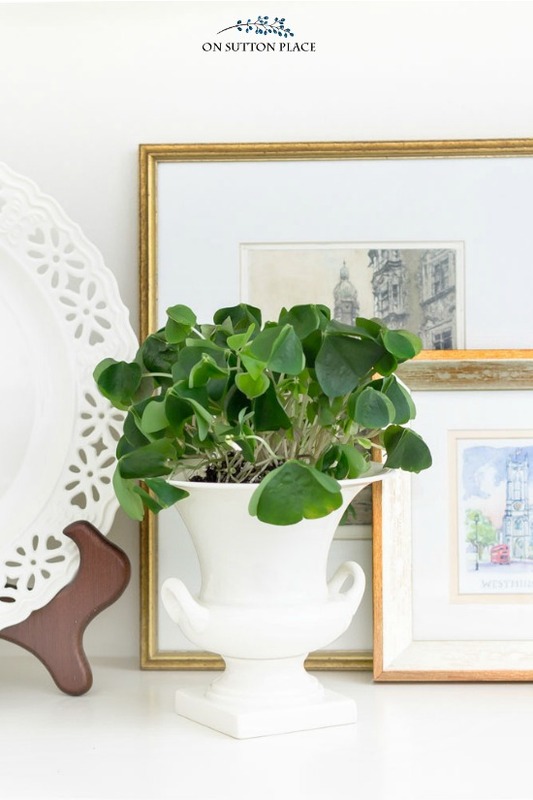 A totally budget-friendly way to bring some color into your decor for St. Patrick’s Day. I promise it will make you smile. Thank you for stopping by…and Go Irish! My hairdresser is Irish and her birthday is in March so I’ve given her a shamrock plant for her birthday. She planted it and had it for the longest time in her shop. It grew rather large! I usually get one for my home too. As a matter of fact I also plant it outside in my front porch planter come late May. It is a nice filler and grows quickly. My niece is a ND grad too!! Plant that lovely little plant in your garden for the summer. I always put them in a pot on my patio where it does not get the hot sun. It makes me smile to see the pretty white flowers it produces all summer long . In the fall I lift it an bring it back inside and put it in a south facing window for the winter months . Sometimes it grows and some winters it just wants to rest, but when the days get longer up it shoots and it starts over again. Did you know they also come in a lovely reddish purple colour. These produce pretty mauve flowers. Spring is on the way!!! Very pretty! My girlfriend has one; her husband trained a camera on it for a day, then fast-forwarded the film. It’s a very active plant – always moving toward the light. So cool! Love all of these prints. I am excited to frame and display for my St. Patty dinner. Thank you so much. I grew up in Michigan and Saint Patrick’s Day was done up right with a local parade, school bands and floats. There is a bit of Irish blood in my background and I too love shamrocks at this time of year. I now live in California and planted them in my yard a few years ago in a protected area with only morning sun. They spread like a ground cover – what a nice surprise! They have lovely small white flowers in spring here. We moved a few years ago and you’ve inspired me to plant some here in our new, much smaller yard. I hope it works! Thanks always for your wonderful posts! Ann – I sooo look forward to your blog. Congrats on your shamrock! I presently have 4 of them (3 greens and a red) and have had them I am guessing for over 20 years. Just like the Irish – can be stubborn but oh so forgiving! My experience with them over the years: (1) make sure they have plenty of drainage (you may have to repot after the holiday providing a slightly larger pot with better drainage, what I refer to as a more permanent pot versus decorative… just sayin); (2) about any light is good except for extremely hot areas or way too much sun; (3) water well when soil is dry; (4) remove dead leaves/blooms as noted earlier by the base; (5) over time if they get leggy, stemmy or just plain listless just take your shears and cut the whole mess off about 1 – 2″ from the soil, water when dry, etc. and they will pop back up even bigger and more beautiful! In other words …they can be resuscitated if necessary just don’t give up on them! And enjoy the beautiful leaves and flowers (white on the green ones, and purple on the red ones) forever and don’t forget to make a wish. Now I will have to fight the urge to drag another one in this season to feed my shamrock addiction! LOL. Thank you so much for all this information. You are the best! Hello! I don’t seem to be able to print anymore, do I need to purchase Box? Thanks! so pretty! Hi Ann! I luv your blog! I find myself always looking forward to and can’t wait for your next post! Today’s lighthearted selection is just what I needed for a rainy Sunday morning! I will be getting one of those shamrock plants! So simple yet so Irish! Thanks, I will plant a shamrock. Your urn is so pretty! I like the way you presented the March prints using my email and sending them directly. I have wanted to write you before to tell you how much I have used and enjoyed your prints and of course a recipe or two! Thank you so much for putting together such a delightful site. County Down? That’s where my mother’s family is from, still wish I would have asked for the Corn Beef and Cabbage recipe it was delicious! I bought a shamrock today while at the grocery store and put it next to the sink and window in my kitchen — it’s supposed to snow tomorrow but I’ll be smiling all day! I bought one today. Yours looks so pretty in the urn! I have never tried to grow a shamrock….maybe this will be the year I give one a try. I am just glad he changed his last name to the American version otherwise I don’t think I could have ever learned to spell it correctly let alone write it…. I stumbled upon your blog through Pinterest and love it! Thins post was further proof that we have a connection. I am married to a huge ND fan and our son is currently a graduate student. Go Irish indeed and thanks for your wonderful blog full of great ideas! My husband is heading to ND tomorrow for a basketball game! Thank you for taking the time to comment and let me know your are following along. Go Irish! Simply lovely idea! I’ll be headed out today to find my very own shamrock. I have 2 shamrocks and have had them for probably 15 years. One little tip–do not over water and keep the dead steams plucked out. Pull them out from the base. Be careful though, you can accidentally pull the little roots up. I have. They are really pretty plants and lovely when they bloom. Mine have been blooming lately. Thank you for the tip on pulling the dead stems. I was not pulling from the base. My plant was soaked through when I got it so I have not watered it yet. I’ll watch that too. I sure hope mine lives! For some reason, the tale of the shamrock tickled me enough to write and suggest that you remember to water it – LOL! Oh yes football……….I have to say a big ole ugh~~ as the world stops in my home when USC plays. Both my husband and son are football crazy, particularly with SC and the only alumni in my family is my son in law John. So I come to my girl cave full of sewing machines and this magical thing called a computer …how did I spend all my time without it? These plants that look like large healthy clover have bulbs in the soil. If you give it a half glass of water, once a week, it will grow forever. If you forget to water, water and watch. Grows in all kinds of light. Isn’t every body irish on March 17? I too am a BIG Notre Dame fan. I grew up in the area. We live for ND football and try to attend a couple of games/ year. 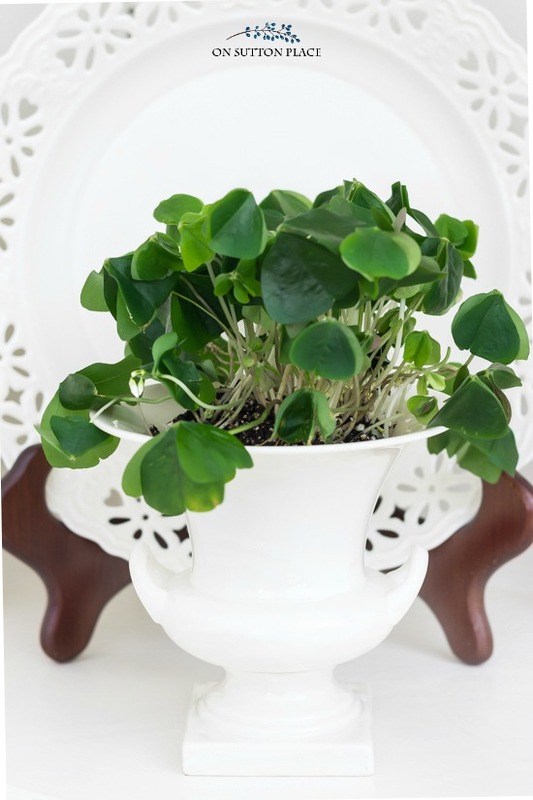 I love the idea of planting a shamrock. Will put it on my too do list for next week. Thanks for the great idea. Not a Notre Dame fan (big Alabama fan here) but I do love shamrocks and haven’t had one in years. I think I’ll go out and look for one to plant this weekend. Hopefully it will enjoy my sunroom as much as I do. Beautiful planter you have there. Hi Deni! This is from another comment on this post. “These plants that look like large healthy clover have bulbs in the soil. If you forget to water, water and watch. Grows in all kinds of light.” Hope this helps because I had no idea! so cute, and maybe I’ll pick one up cause I’m not really in the mood to decorate for St. Patty’s. We are not Irish, but you’d have a run for most obsessed fans! My father and his brother both graduated from Notre Dame, from the time I was little we had seasoned seats (6) for football and attended every game. We also attended just about every basketball game! Now we are 2 hours from Notre Dame in IN, so at night for basketball games it was a very long evening! We played the Notre Dame theme song at my Dad’s funeral, and used their colors with flags. My whole family is obsessed with Notre Dame! Your shamrock reminded me of a neighbor I had 40 yrs ago. I was in my 20s and she in her 80s. Her shamrock plant was approximately 12 inches in diameter,and she said she couldn’t remember how long she’d had it. She would set it out in the sun each afternoon in the early spring and it would be full of blossoms most of the summer. Thanks for the memory, going out to get myself one in memory of Margaret. Love this story…thank you for sharing! 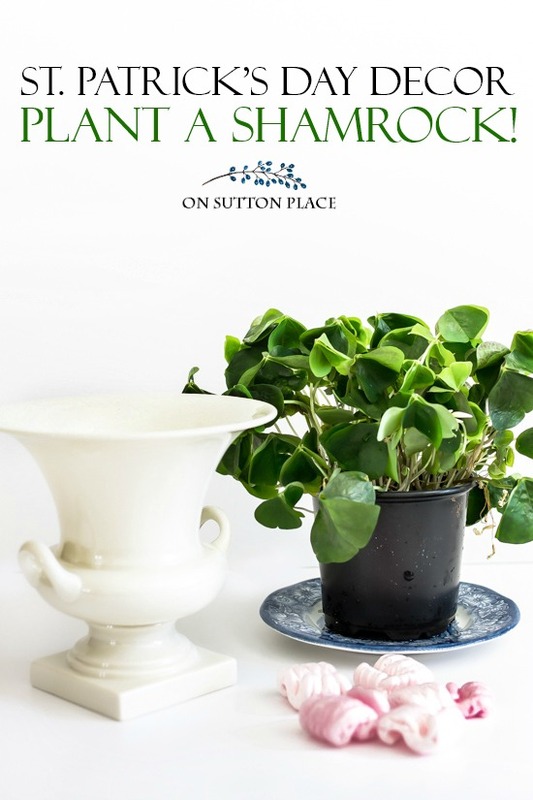 I’m not even a drop of Irish, but what could be better than a pretty little plant that might bring some luck! In regards to the picture on your page of your home tour. The bag with the tulips, do you have any of those bag for sale? Ann, you are my daily inspiration!! I enjoy your attention to details and your delicious recipes….thank you for sharing! Have a beautiful day! How pretty. I am part Irish and I have never planted a shamrock! I will see if I can find any in the store. So pretty! I love the vignette too! No Notre Dame Alumni here but big Notre Dame fans nonetheless! Go Irish!